One of the things I’ve been enjoying so much about my time in India is having the opportunity to meet and work with such a large variety of incredible musicians. Many of my meetings have been the result of careful planning and coordination, but some of my most exciting meetings have happened purely by chance. Perhaps one of my happiest chance meetings was with Roshna Sawaden. Roshna is the youngest musician I’ve gotten to know so far – she is thirteen years old, and lives in Darap, a small town outside of Pelling in West Sikkim, a north-eastern state that borders Nepal, in the Himalayas. A slight girl with Dorothy-style french-braided hair, she is shy and quiet until she steps onto the stage. The director of the cottages where we stayed in Sikkim invited Roshna and a few other girls from the town to sing and dance for us one evening. Of course, all the girls were so sweet, watching each other self-consciously as they danced, trying not to stick out or mess up. But Roshna was a clear standout – she was at once gracious and confident – her dancing grooved, her singing voice was warm and mellifluous, and the energy and charisma she brought to her performances were infectious. She immediately stood out to me as a profound talent, someone who had developed an individual style and means of expression at an age where most young performers are simply trying to figure out the basic mechanics of their medium. 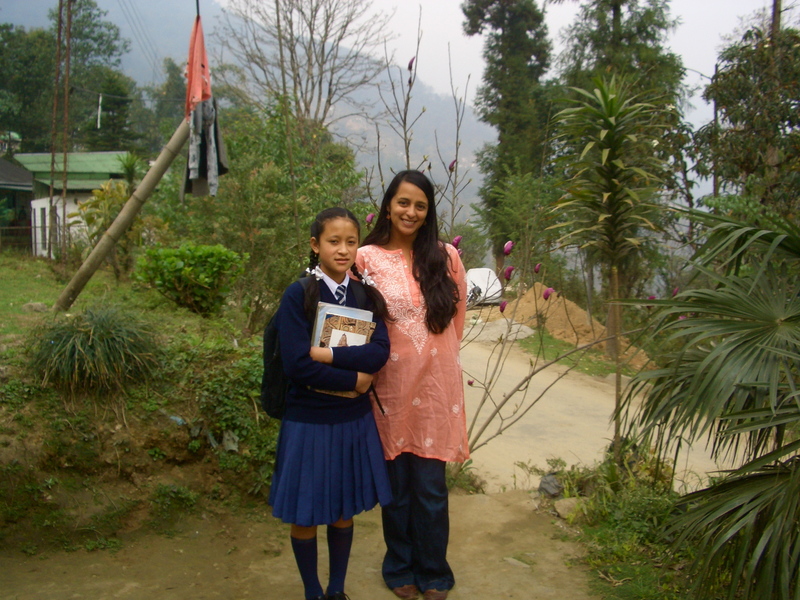 I met with Roshna and her family the next day, before she headed off to school with her brother. Though she spoke mostly Nepali and was very shy (most likely because we didn’t share fluency in the same language), she could still understand my awkward Hindi, and we managed to communicate with each other. She told me that she has been singing and dancing for eight years, and that she is self-taught. There is no vocal or dance teacher in Darap (the town has a population of about 600 people) — she learns song and dance numbers from Nepali films by herself and with her friends. In what is a happy coincidence, her father, Santosh Sawaden runs a small media lab in town called Tashbir Digital Studio, where he does everything from lamination to making short films. He has made a number of videos (a few of which I’m posting below) that feature her. As her father was showing me videos he had cut of her from the last few years, I asked him what his hopes were for her. He voiced his full support for Roshna and her dreams – acting, dancing, singing – whatever she wanted to do, he would be behind her. Her whole family is warm and loving, and it seems that she’s well supported in her development as a young performer. I wished that I had been in town for longer (I met with her just a few hours before we left Sikkim), and gotten a chance to know her better, and perhaps even spent some time singing and dancing with her. Her unbridled energy on the stage inspired me, and I have no doubt that, as her name suggests, Roshna is on her way to a very bright future. I was hoping to be able to show you a video of only Roshna singing, but her father didn’t have anything that wasn’t already highly produced. Though the aesthetic of these videos might be a little overwhelming to the western sensibility (they are much more suited to the Indian one), I wanted to at least give you an idea of her ability. another example of a great journey and how India turns up unplanned gems. I love how you see talent in the child and how it appeals so much to the teacher in me… and the signs of parent investment in the child’s goal. super story!